Its the early 90's and a young wrestler named Mick Foley was trying to make a name for himself. He was given what is called a test or "dark match" on the now defunct World Championship Wrestling. He was wrestling the Stiener Brothers who were known to be aggressive in the ring. 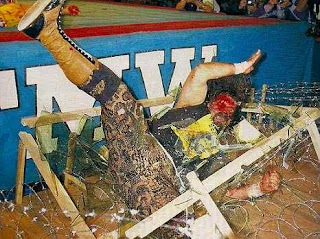 During the match Mick dove from the ring and hit and elbow onto concrete. Something never attempted before. WCW Employee Arn Anderson went up to him and asked what kind of "sense" that made to risk his body for the fans like that. Foley replied "because I have no dollars." Mick Foley exemplifies what the wrestling business is all about. What does Triple H, Brock Lesnar, The Briscoe Brothers, Adam Cole, Randy Orton, John Cena, Seth Rollins, Mick Foley, wrestling fans and countless others have in common. They are all tougher than Floyd Mayweather. No doubt about it he is a draw. Floyd will make $120,000.000 from one nights worth of work. I refused to watch. Floyd doesn't give a damn about you. The "fight of the century" was never about your entertainment but rather lining the fighters pocket book. Very few WWE superstars and wrestlers get into the business for the money. If they do, they usually don't last.And as fans we appreciate it and notice that.. Hell, the WWE has worked almost two years to get Roman Reigns over. It is starting to work because fans see he is WORKING FOR IT. Being pushed today, is the proverbial kiss of death. Most WWE stars start off in it was called the "indies" where most wrestlers don't get paid and wrestle in front of 15-20 people a night because they LOVE IT. I spoke to one insider who said some get paid in nothing more than a "hot dog and a handshake." Its not about the money or the fame. They love performing for YOU. The sorry and old argument that WWE is fake is as tired and gassed out as Al Snow after a 10 minute match. Triple H tore his quads and STILL wrestled after only 8 months of rehab. Unheard of by sports standards. 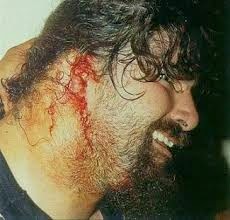 Mick Foley lost an ear. (pictured below) Rey Mysterio Jr. has had surgery 5-6 times on his knees and unfortunately killed a man in the ring. and serious injury are just as real as boxing. Floyd Mayweather would never box in front of 20 people without millions on the line. Neither would Hulk Hogan. The difference is the performance is not about the Hulkster even at this late stage. With 100,000 people expected at WrestleMania 32 everybody on that card will want to impress YOU! Its about excelling and pushing physical limits for OUR entertainment. It doesn't bother me that Mayweather is rich. It bothers me that he does it flaunting it in our face. Because he doesn't give a DAMN. You've been duped, bamboozled. You can't ask for your money back. Mayweather has probably already spent it. If your not a fan, I encourage you to watch Monday Night Raw on USA network tonight and see the guys HUSTLING for your entertainment. Watch Ring of Honor on the weekends, Reality of Wrestling or one of the many other alternatives to the WWE machine. The business runs on YOU and not just your money. I wish I could say the same for Floyd Mayweather.